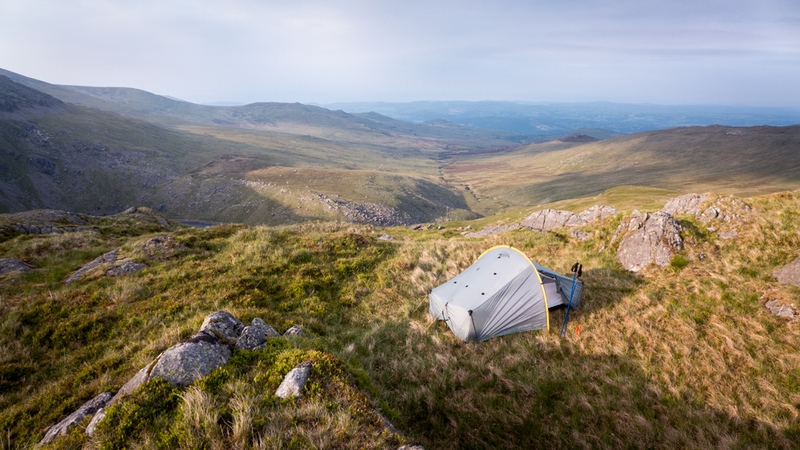 I hatched a slightly last-minute plan for a night camping in the Carneddau, so after finishing the school run I was on my way towards Betws-Y-Coed and heading for the Roman Road into the hills by Bwlch y Ddeufaen. 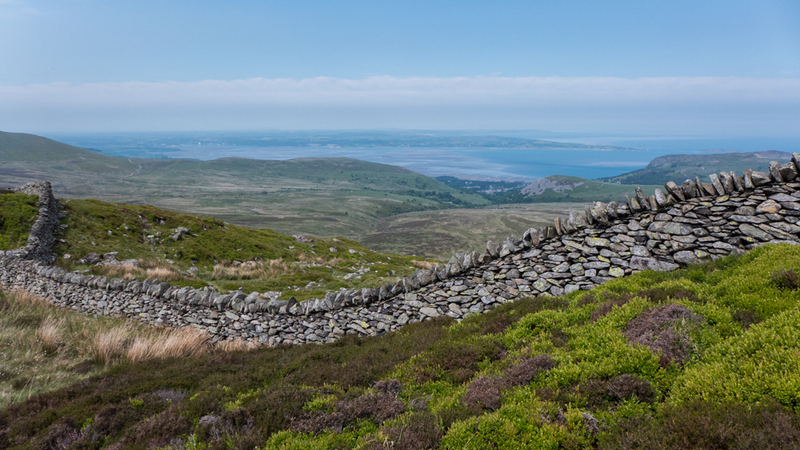 Anyone who expects Roman roads to be straight will be surprised by this single-track road, hemmed in between high dry-stone walls, between Tal Y Fan to the north, and the main Carneddau ‘massif’ to the south. Just always remember where the last passing space was, and pray you don’t meet anything coming the other way. I’d parked up at the end in the small car park, and picked up a small trail over a rocky rib at the eastern end of Foel Lwyd, with a buzzard watching overhead. While the path gained height quickly, it soon deteriorated into deep and steep heather, and left me the wrong side of a wall near the summit. The walls here are all beautifully maintained, so I reluctantly and very carefully clambered over onto the ‘right’ side. The path onward to Tal Y Fan was short and easy, with a brief steep drop into a small col before the true summit and trig point is reached. A quick break, then back down directly to the road. 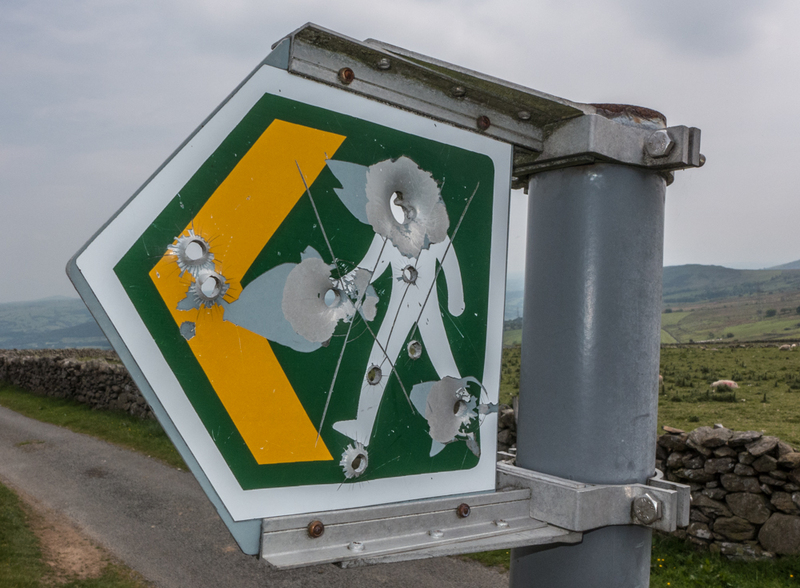 The signpost by the road looked had received some unwanted attention from a firearm, and was a reminder that Walkers aren’t always Welcome. Walking up the road back to the car park, the contrast between the sheep-devastated moorland of the ‘open hillside’ and the roadside verge was remarkable. On the hill, I’d really seen nothing flowering except Tormentil and some rather forlorn Milk-wort. 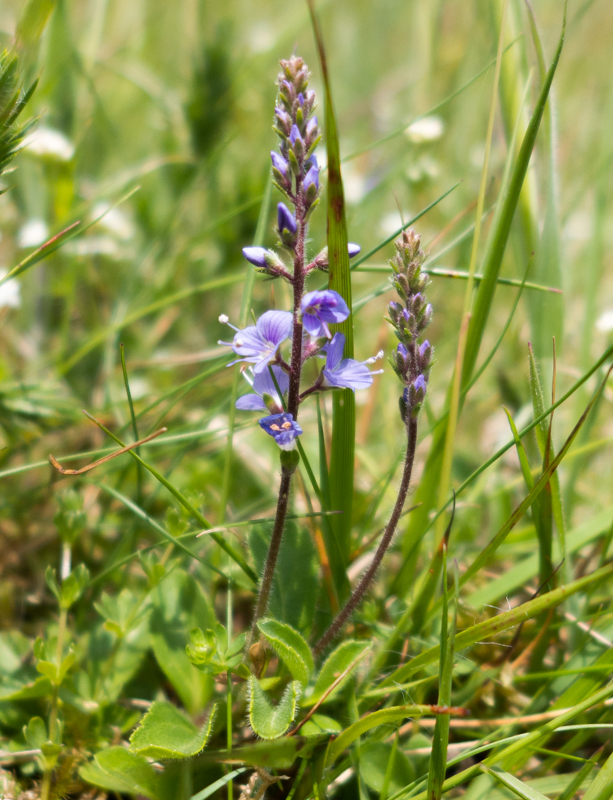 But the verges were overflowing: Speedwell, Cuckoo Flower, Herb Robert, Foxgloves (not yet out) and many more… Possibly the walls and road give shelter and some extra warmth, but I’m sure the absence of woolly lawn-mowers is the main reason. Back at the car I picked up the tent and continued up to the bwlch. 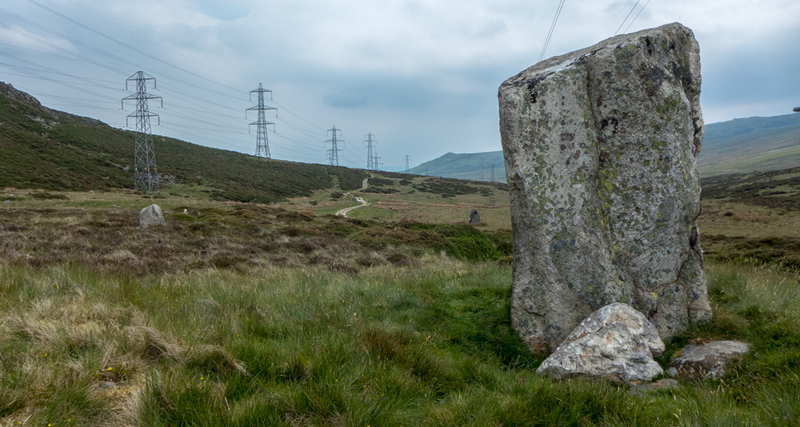 The whole area here is awash with prehistoric sites – a chamber tomb further down the valley, a stone circle (which I’d walked past without noticing – mostly hidden by the high walls) and the two standing stones after which the bwlch is named. The stones mark the highest point of the blwch and you can see the evidence where the power cables and gas pipeline have followed the same path of least resistance taken by the Roman Road, probably built on a much older highway. 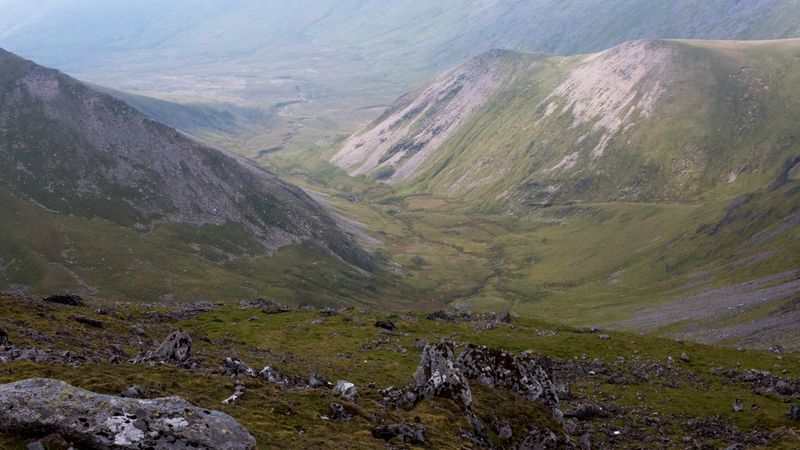 From here, the path up to Drum and Foel Fras is a long slog over grass, following the fenceline all the way. Two Carneddau ponies appeared, one rubbing its neck continually against the fence, the bizarre sound from the vibrations running along the fenceline almost 100m away. The sun had been beating down most of the day, and it was a relief to reach the top of Foel Grach. The refuge looked pretty uninviting in these conditions, but has apparently been a lifesaver in winter in years gone by. 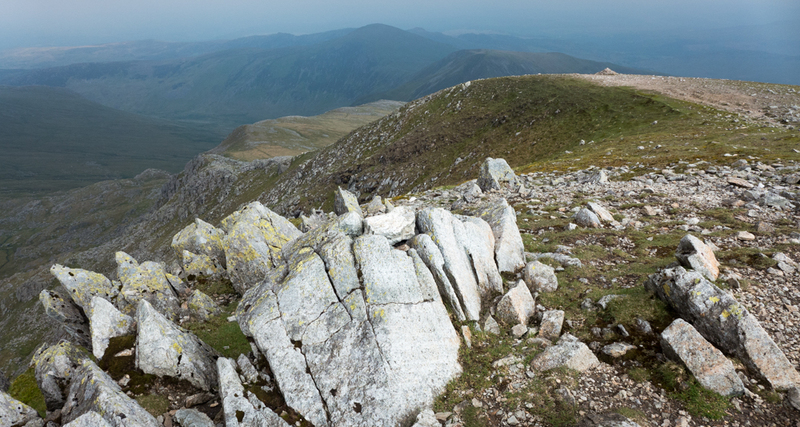 Rather than following the path directly up to Carnedd Llewellyn, I sidetracked towards Yr Elen, with great views into the dark cwm and Fynnon Caseg. Yr Elen would have to wait for another day, as I wanted to find a pitch for the tent before my legs gave out. I’d been thinking of using the bothy at Dulyn, but camping out in the fine weather seemed far preferable, and would save several hundred metres of descent and re-ascent the next day. Heading down from Carnedd Llewellyn, I aimed for the ‘nose’ between the two reservoirs, and soon found flat, sheltered and only slightly boggy pitch close to a small stream. Tent up, meal cooked, and I was out like a light before the sun had even set.